See the various sections below for the most frequently asked questions. If you still have a question after browsing the items below, don't hesitate to contact us. Does BriefCatch work with Office365? Yes. However, only with the locally installed version (Word 2016.) BriefCatch does not work with the online or app versions of Office365. How do I download BriefCatch? You must register a new account by signing up for the free two-week trial or by purchasing an annual license. After registering, you will have access to the download page, where you can save BriefCatch to your computer. Note: You must be logged in to download BriefCatch. My browser is warning me that BriefCatch.exe may be unsafe. Some browser settings may prevent .exe files from being downloaded, or warn you that the file may be unsafe. If prompted, make sure you mark BriefCatch.exe as safe so you're able to access the file. If you’re having trouble, we also have a zipped version available. You’ll have to unzip the software before installing it. Are there any prerequisites for installing the software? The only requirements are a Windows PC with Word. How do I install BriefCatch? After I installed BriefCatch, I received a notice upon opening Word. What does this mean? The first time you open Word after installing BriefCatch, you may be prompted to confirm the installation. If so, click the Install button. There is no BriefCatch tab in Word after installing. This can also occur if Word was open while BriefCatch was installed. To help resolve this, completely uninstall BriefCatch, restart your computer, then try installing BriefCatch again. Make sure Word is closed before running the installation again. If this is an issue for you and you are not able to use BriefCatch due to this, please contact us so we can suggest some additional installation options. I see a BriefCatch tab in Word but BriefCatch does not work. Close and reopen Microsoft Word. Open the installation file again and choose Repair. Within Word, click File - Options. In the Options menu, click Add-ins. Near the bottom, click Go next to “Manage COM Add-ins”. Ensure that “Legal Writing Pro’s Brief Catch for Microsoft Office” is listed and checked. Click OK. If BriefCatch still does not work, please contact us for help. How do I know which version of BriefCatch I’m running? Check the current version shown on the download page to see if you’re running the latest version. 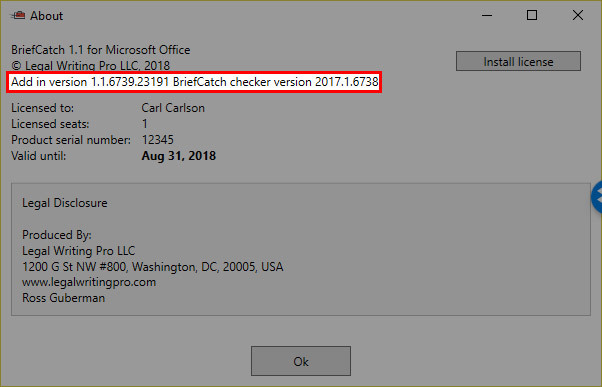 How do I update the BriefCatch software? How can I be notified of updates to the BriefCatch software? Under the my account page, check “Notify me when a new version of BriefCatch is released.” When we release a new version, you will be notified via email. 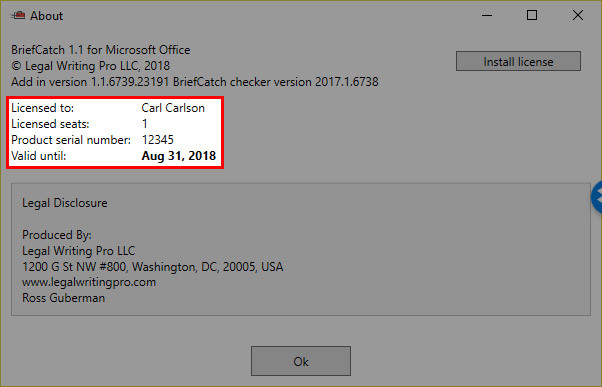 How often is the BriefCatch software updated? Major releases once or twice per year. Minor releases every 1-2 months with bug fixes or smaller improvements. View our complete BriefCatch changelog. How do I uninstall BriefCatch? To disable the add-in within Word, click on File - Options, then click on Add-ins. Next to Manage COM Add-ins, click Go. Uncheck Legal Writing Pro's BriefCatch for Microsoft Office. 1) Open the installation file and select Uninstall. 2) Click the Windows Start Menu and type "Add or remove programs", then click on it. Find BriefCatch within the list, click on it, and choose Uninstall. Does BriefCatch work with Google Docs? Does BriefCatch work on mobile devices? How do I use BriefCatch? Does BriefCatch provide legal advice? Absolutely not. Just editing suggestions. Can BriefCatch be used on all types of legal documents? Yes, though for contracts I recommend my Contract Catch. Can BriefCatch be used on nonlegal documents? Can nonlawyers benefit from it? What functions does BriefCatch provide? Catch: Runs BriefCatch on the current document and scans for thousands of possible suggestions. Clear: Clears the BriefCatch markup. Stats: Scans the document and displays global statistics based on five proprietary algorithms that each yield a maximum score of 100: Reading Happiness Score, Sentence Length Index, Flow Index, Punchiness Index, Plain English Index. Report: Generates a one-page narrative report on the current document that shares data on sentence and paragraph length, possibly overused language, and general strengths and weaknesses. About: Displays information about the BriefCatch software and license. Feedback: Allows you to share feedback, report issues, or make suggestions. How does BriefCatch make suggestions? The Catch function will apply thousands of rules and algorithms and will highlight matches throughout the text. A side panel will suggest changes and offer general editing advice. For more information, visit the “Catching” a Document section on the download page. The five special scores are designed both to measure and to motivate. They are explained here. How does BriefCatch treat quotations? It ignores most quotations, so you won’t waste time editing them! Why isn't the Stats function working? The Stats function requires the current document, or selection within the current document, to contain more than 400 words. If the document or selection contains 400 or fewer words, Stats will be disabled. Can I run BriefCatch on part of my document? Yes! By default, the Catch function will run on the entire document. However, you can also select the text you'd like to analyze before clicking on Catch. BriefCatch will only analyze the selected text. How much does it cost to purchase a BriefCatch license? You can see our current pricing on our purchase page. BriefCatch is currently available on an annual basis. Will my BriefCatch license automatically renew? No. Once it expires, you will need to purchase a new license. How do I download my BriefCatch license? After you purchase BriefCatch, your license will be available on the download page. Click the download link to save the license.key file to your computer. How do I install my BriefCatch license? Click on About under the BriefCatch tab in Word. From there, click on Install License. Navigate to the license.key file you downloaded above and press Open. You will then receive the message "Your license was successfully imported." How do I know when my BriefCatch license expires? The download page on our website shows the details of your license, including expiration. My license file was rejected or will not install properly. If you’re having trouble installing your license, please contact us and include the error message you’re receiving. Can I use BriefCatch on more than one computer? Yes, as long as you are the sole owner of each device. Do you offer discounts for enterprise or bulk purchases? We are offering trials and special pricing case-by-case for groups. Groups are generally ten or more people. See our sales page for more information. Can I gift BriefCatch to a friend or colleague? Absolutely! You can purchase a coupon code to gift BriefCatch. Two weeks. During that time, you will have full access to the BriefCatch software. You can sign up for the free trial here. Is a credit card required to use the free trial? No. The only requirement is registering an account by providing your name and email address. Do I need a license for the free trial? No. Simply download and install the software and BriefCatch will work for two weeks. I'm receiving an error message that says my trial has expired before the two weeks. If you're receive an error message related to your free trial immediately after installing BriefCatch, or anytime prior to the two weeks, please contact us for further assistance. Can I sign up for the free trial more than once? No. The free trial is limited to one time per user. Can I put my trial on hold after signing up? If for some reason you would like to put your trial on hold or change the start to later in the future, please contact us for assitance. How can I keep using BriefCatch after the free trial expires? After the two-week trial, BriefCatch will no longer function. To keep using it, you simply need to purchase an annual license. How can my company/firm/court request a free trial? We offer extended free trials on a case by case basis. Please fill out our sales form for more details. Do you save or track any data or usage? No. We have no access to any documents or files you use with BriefCatch nor do we track or store any data. Is BriefCatch cloud-based? Are there any security issues whatsoever? No and no. BriefCatch is installed only on the local drive of your computer and does not connect to any servers. Does any aspect of the document or the information collected on the document go back to you? No. We have no access to documents used with BriefCatch. Do I need to disable my firewall or internet security settings? No. Once downloaded and installed, BriefCatch will work on your machine until the license expires without ever requiring an internet connection. Payments are processed by a third party (https://stripe.com). No credit card information is ever stored directly on our site. Our site uses SSL 256-bit encryption to ensure that all transactions are secure. The private certificate has been issued via Trustwave Holding, Inc.
Charges will show up on your statement as LEGAL WRITING PRO. What can I do if my credit card was blocked or rejected? If your card was blocked, you can try using a different credit card. You can also contact support for assitance. How can I log in to the website? Where can I find details on my subscriptions and payments? Visit your account page under the Subscriptions and Payments links. We do not store or have access to any member’s passwords. If you’ve forgotten yours, you can manually reset your password here. I’ve forgotten which email address I used to register. How can I provide feedback, endorsements, or suggestions? Please fill out our contact form. We would love to hear from you!